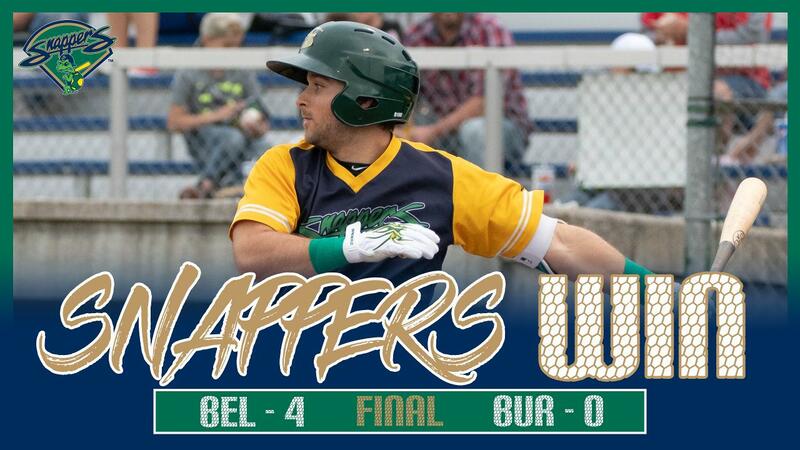 BURLINGTON, IA - The Beloit Snappers took game two of a four game set against the Burlington Bees tonight by a final score of 4-0. The win was the Snappers first shutout of an opponent this season. Opening night starter, Chase Cohen, would get the ball for his second start of the season and was absolutely dominant on the hill Tuesday evening. Cohen would throw up nothing but zeroes on the scoreboard tonight going 6 strong innings of scoreless baseball. Cohen would come out of the game after the 6th in line for the win, after surrendering just 2 hits, 0 R, and striking out 6. The Snappers would also get it done at the plate providing some run support for Cohen. Beloit would strike for 3 runs in the 3rd inning pushing them out in front and giving the Snappers and Cohen all the runs they would need. Marcos Brito started the scoring off with an RBI single extending his on-base streak to 5 straight games and providing the Snappers the first run of the game. Then, Burlington starting pitcher, Hector Yan, would balk twice allowing Payton Squier and Brito to come in to score pushing the Snappers lead to 3-0. In the sixth, the Snappers would pad their lead so more sending another run across home plate. Squier would single with one out before scoring after an error by second baseman Gleyvin Pineda resulting in the only run of the inning. Eric Mariñez replaced Cohen after six brilliant innings and picked up right where Cohen left off. Mariñez would pitch one and two-thirds inning of scoreless baseball before leaving with 2 Bees on in the eighth. Calvin Coker would enter in a high leverage situation and was masterful punching out Pineda looking and stranding two Bees on base to preserve the 4-0 lead heading to the ninth. Coker would then slam the door shut in the ninth retiring the Bees in order and securing the Snappers their first shutout win of the year. The Snappers will play two more games in Burlington tomorrow and Thursday before returning home on Friday to begin a six-game home stand against the Clinton Lumberkings and the Wisconsin Timber Rattlers.